Travel is good for the soul. In fact, research has shown those who jet set every year reduce their chance of developing serious diseases- so consider it doctor's orders to travel! But, when I'm not traveling, the next best thing that I think is good for my soul is spending time with friends and family. 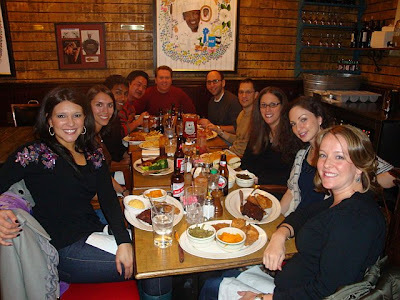 So this past Saturday night, we headed to Rack & Soul on the Upper West Side of Manhattan for dinner with our friends. 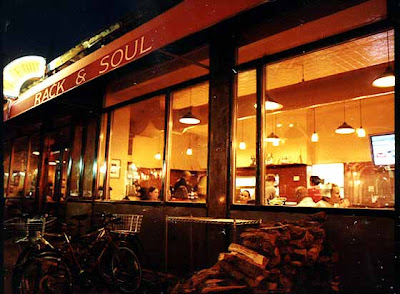 Rack & Soul prides itself on serving New York City's finest Soul Food and Wood-Smoked Barbecue. 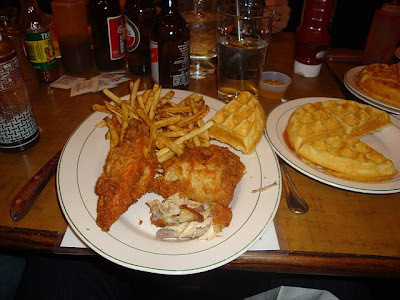 I have to admit that I was a bit skeptical when I read that, and when we walked into the brightly lit restaurant (I like a restaurant a little darker at dinner time- not diner style)...but, I have to say my first impressions were quickly squashed as soon as I took my first bite of their Fried Chicken! Delish! It was well-seasoned, crispy on the outside, and nice and juicy inside. It came with your choice of two sides (we tried more than 2- Mac & Cheese, Candied Yams, Potato Salad) and we ordered one of their waffles. 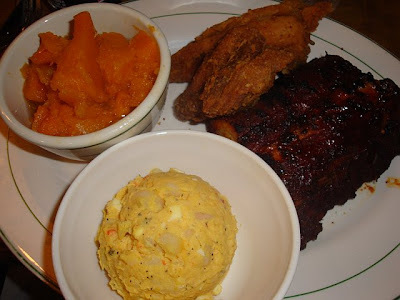 Let me just say to heck with etiquette...this dish was finger-lickin' good!!! I also tried their baby back ribs which were awesome as well! 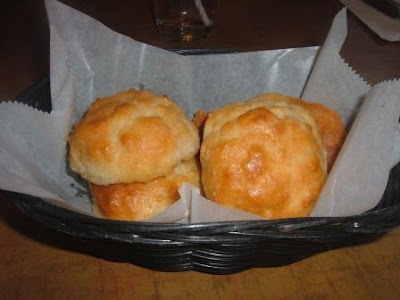 They also serve basket after basket of hot, sweet and buttery rolls on the table. They rock! 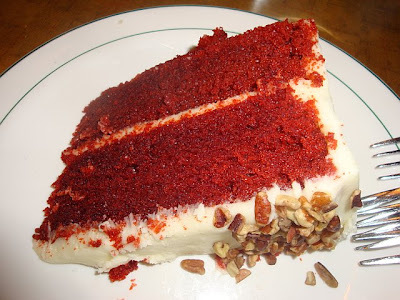 For dessert, we had their red velvet cake (which I usually don't love...I am now obsessed with this one!)... 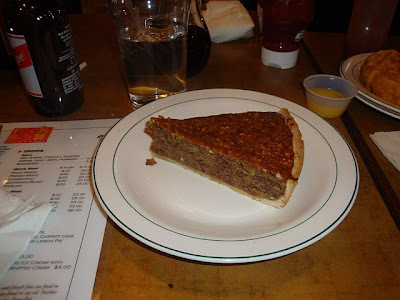 We also had a slice of their pecan pie...so yummy! There was a lot to celebrate on this night out, Ajay's birthday, the birth of Dave & Stephanie's baby boy Charlie, and Will & Karen's pregnancy! It was food that was good for the soul and a good time was had by all! pics & blog are great!! We should definitely do this more often!